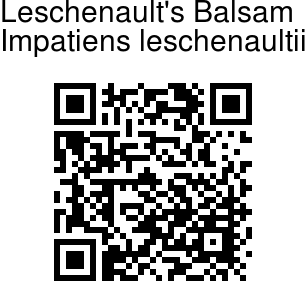 Leschenault's Balsam is a rare balsam found in the Nilgiri hills. 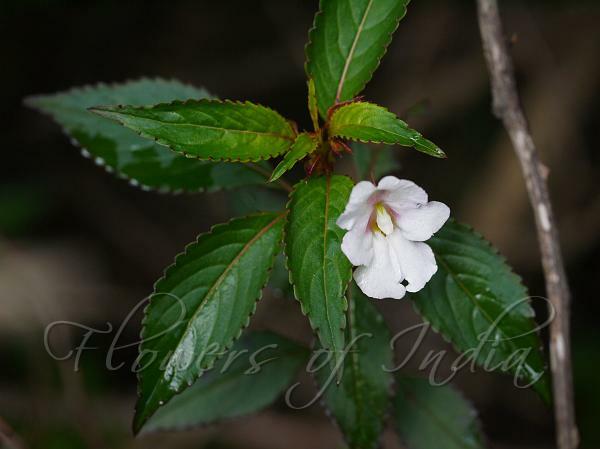 Flowers are white with pinkish tinge. Upper sepals are ovate, long-pointed. Standard is 2-lobed spurred at the back, wings 2-lobed, lib boat-shaped. Spur is slender, incurved. The plant is almost shrubby, with stalked elliptic leaves arranged opposite and alternate, recurved. Leaves base is narrow, tip long-pointed and margin toothed. Identification credit: Derick Pitman, Ashutosh Sharma Photographed in Old Ooty, Tamil Nadu.